Music by J. C. Bach, Beethoven, Brahms, Dvorak, and Mozart. Edited by Gayle Kowalchyk and E. L. Lancaster. Duet or Duo; Graded Standard Repertoire; Masterworks; Piano Duet (1 Piano, 4 Hands); Solo Small Ensembles. Alfred Masterwork Edition: Essential Keyboard Repertoire. Masterwork; Recital. Book. 170 pages. Alfred Music #00-36434. Published by Alfred Music (AP.36434). 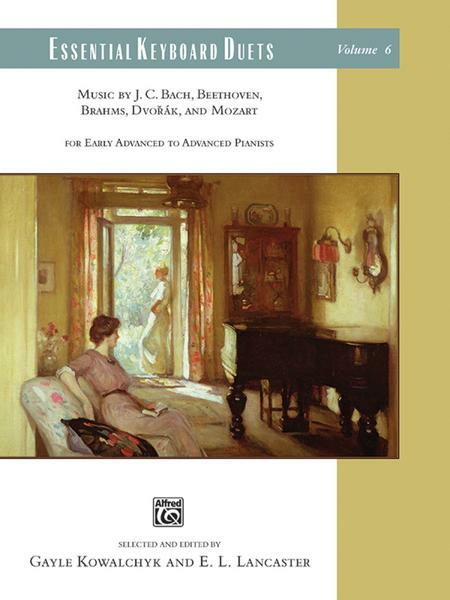 This collection of piano duets (for one piano, four hands) includes the most popular Classical and Romantic repertoire and is appropriate for early advanced to advanced pianists. It includes music by J. C. Bach, Beethoven, Brahms, DvorÃ¡k, and Mozart. The primo and secondo parts are on separate pages and essential ornamentation is realized in footnotes. Both parts contain measure numbers for easy reference. Titles: Sonata in F Major, Op. 18, No. 6 (J. C. Bach) * Sonata in D Major, Op. 6 (Beethoven) * Hungarian Dances in G Minor, F Major, F Minor, and F-sharp Minor (Brahms) * Waltzes, Op. 39, Nos. 1, 2, 11, 14, and 15 (Brahms) * Slavonic Dances, Op. 46, Nos. 2 and 8 (DvorÃ¡k) * Sonata in D Major, K. 381 (Mozart) * Sonata in B-flat Major, K. 385 (Mozart).